06/03/14 -- Soycomplex: Beans closed sharply higher on old crop after the USDA's weekly export sales report showed no let-up in export demand for US soybeans. Old crop sales came in above expectations at 772,700 MT, including 469,100 MT for "unknown" destinations. There were also net new crop sales of 256,700 MT, primarily for China (183,000 MT). Weekly shipments of 1,173,600 MT were down 35 percent from the previous week, but still pretty impressive for this time of year nevertheless. The primary destination was China taking 645,000 MT. Old crop commitments are now 107% of the USDA's target for the season, which gives them an interesting problem to solve in Monday's WASDE report given their "line in the sand" strategy of refusing to cut US ending stocks below 150 million bushels. The USDA attaché in Paraguay estimated their 2013/14 soybean crop at only 8.1 MMT versus a USDA estimate of 9.3 MMT. The attaché estimated Paraguay's 2013/14 bean exports at 3.6 MMT versus a USDA estimate of 5.8 MMT. The FAO's Agricultural Market Information System (AMIS) cut their forecast for world soybean production in 2013/14 by 6 MMT to 283 MMT, which is now 5 MMT below the USDA's Feb estimate. They trimmed global ending stocks by 2 MMT from last month to 32 MMT, which is way below the USDA's comfort blanket estimate of 73 MMT. "In Argentina, conditions are good with approximately 85% of the first crop, and approximately 75% of the second crop (planted after winter crops) in good condition. In Brazil, conditions are mixed. They have deteriorated since last month due to excessive wetness in Mato Grosso and dry hot conditions in Parana. A bumper crop is still expected because area planted relative to last year was expanded significantly at the expense of maize. Harvest is currently underway although it is likely to be delayed in some areas due to wetness," they said. Funds were said to have added a net 5,000 soybean contracts to their already huge long position. Will tomorrow see some profit-taking ahead of Monday's report? 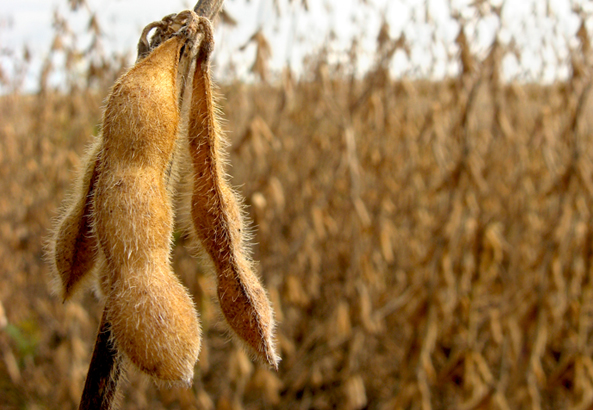 Mar 14 Soybeans closed at $14.37 1/2, up 17 1/2 cents; May 14 Soybeans closed at $14.38, up 17 1/2 cents; Mar 14 Soybean Meal closed at $458.40, up $0.70; Mar 14 Soybean Oil closed at 44.27, up 109 points. Soyoil has suddenly gone from zero to hero, closing at the best levels for a front month since late last August tonight as palm oil prices rise on dryness in Malaysia and Indonesia. Corn: The corn market jumped around 9-10 cents, also aided by a set of strong weekly export sales from the USDA. These came in at 1,518,000 MT for old crop - up 81 percent from the previous week and 35 percent from the prior 4-week average. There were also new crop sales of 164,500 MT reported for Japan. Shipments this week came in at a respectable 1,138,147 MT, taking total exports for the season so far to 18.4 MMT, with a further 19.2 MMT of sales outstanding. If the latter were all to get shipped, and that is potentially quite a big if, then total commitments are 37.6 MMT, or nearly 92% of the USDA's target for the season which is only halfway through. That would suggest that the USDA might have to increase this forecast on Monday. They already upped it by 4 MMT in February. The FAO's AMIS raised their forecast for the world corn crop in 2013/14 by 6 MMT to 1006 MMT, although increased consumption meant that ending stocks remained unchanged at 175 MMT. That's still a fair rise on carryout of only 131 MMT last season though and is 18 MMT higher than the USDA's current forecast. "In the southern hemisphere conditions are mixed. In Argentina, approximately 70 % of the crop is rated in good condition. Welcome and timely precipitation across the major growing regions helped to support crop development and harvest has begun in northern growing regions for the early planted crop. In Brazil, conditions are mixed and have been slightly reduced since last month due to dry hot conditions in south east and south central growing areas. Planting of the second crop is underway though is delayed in Mato Grosso due to wetness, which is delaying soybean harvest. Planted area for both the first and second crops is down, due to an increased area planted to soybeans," they said. Fund money was estimated as adding around 14,000 corn contracts to their net long position on the day. Mar 14 Corn closed at $4.85 3/4, up 10 1/2 cents; May 14 Corn closed at $4.91, up 9 cents. Wheat: The wheat market was only modestly higher, with the exception of soon to expire and extremely technical Mar 14 Minneapolis wheat, which had something of a fit closing almost 40 cents higher on the day. It feels like wheat would possibly have finished lower if it wasn't for spillover support from corn and beans. Weekly export sales for wheat came in at 556,100 MT of old crop and 44,400 MT of new crop which was in line with expectations for sales of 350-650 TMT. Mexico (213,100 MT), Brazil (93,100 MT), unknown destinations (63,600 MT) and China (60,000 MT) were the main takers. Total wheat shipments now stand at 23 MMT with a further 5.6 MMT of outstanding sales. The USDA target for the season is 31.5 MMT. The FAO's AMIS raised their estimate for the global wheat crop by 2 MMT to a record 716 MMT, and increased ending stocks by 3 MMT to 179 MMT. The USDA are currently at 712 MMT and 184 MMT respectively, but will issue revised forecasts on Monday. "In Ukraine and Russia, conditions are good and the crop is in the dormancy phase. Following the extreme cold temperatures last month, unseasonably warm weather moved into southern regions of Ukraine and southern Russia, melting much of the snow cover which could increase their vulnerability to frost damage in the event of a drop in temperatures. To date, no wide-spread winter damage has been reported and an assessment of wintering and crop damage will be made at the end of dormancy. In the US, dryness across the Southern Plains is continuing to raise some concern over the dormant crop, particularly in areas that have experienced colder than normal temperatures and lack protective snow cover. However, no damage has been reported to date," they said. Iraq bought 200 TMT of wheat from Canada and Australia. Taiwan bought 83,150 MT of US milling wheat. Japan bought 111,779 Mt of wheat for April–June shipment from the US, Canada and Australia. Mar 14 CBOT Wheat closed at $6.41 1/2, up 4 1/4 cents; Mar 14 KCBT Wheat closed at $7.06 1/4, up 3 cents; Mar 14 MGEX Wheat closed at $7.41 1/4, up 39 3/4 cents. 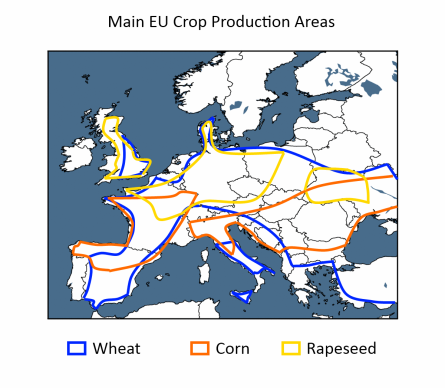 06/03/14 -- EU grains closed mixed, with wheat mostly lower as tensions between the West and Russia eased and hopes that a diplomatic solution to the problems with Ukraine increased. Mar 14 London wheat closed GBP0.60/tonne lower at GBP161.60/tonne, whilst new crop Nov 14 was GBP0.25/tonne easier at GBP153.25/tonne. Mar 14 Paris wheat closed EUR0.50/tonne higher at EUR208.25/tonne, new front month Jun 14 Paris corn was down EUR0.25/tonne to EUR182.75/tonne, whilst May 14 Paris rapeseed was EUR7.25/tonne higher at EUR414.00/tonne - the highest close for a front month since last June. The FAO's Agricultural Market Information System (AMIS) raised their forecast for the world 2013/14 wheat crop by 2 MMT from last month to a record 716 MMT, and increased ending stocks this season by 3 MMT to 179 MMT, a 20 MMT hike on last year. They also raised the world 2013/14 corn crop by 6 MMT from last month to a record 1006 MMT. Although ending stocks were left unchanged at 175 MMT that's still a sharp 44 MMT increase on carryout in 2012/13. 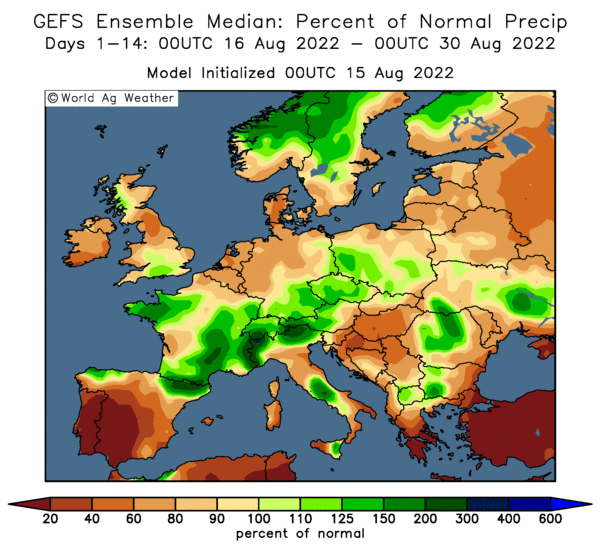 They didn't release any forecasts for 2014/15 production, but noted generally "favourable" conditions for winter wheat in the northern hemisphere. "In the EU, conditions are variable. Western Europe has experienced a mild winter with very wet conditions. 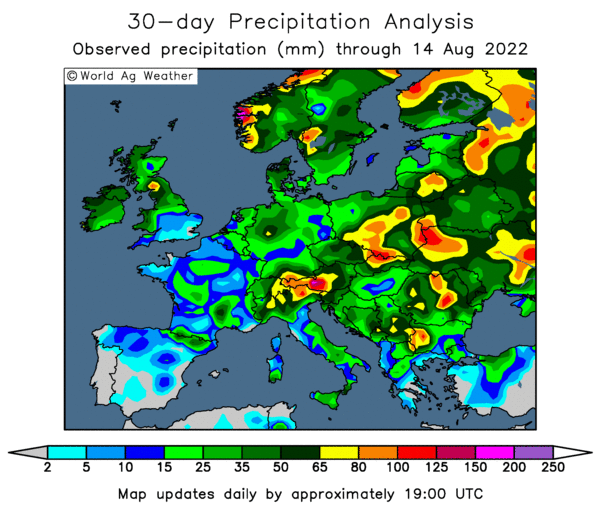 Central-Northern Italy and British Isles experienced exceptionally wet conditions leading to floods and widespread water logging. In the absence of drier conditions in coming weeks, winter crops may be locally severely impacted. 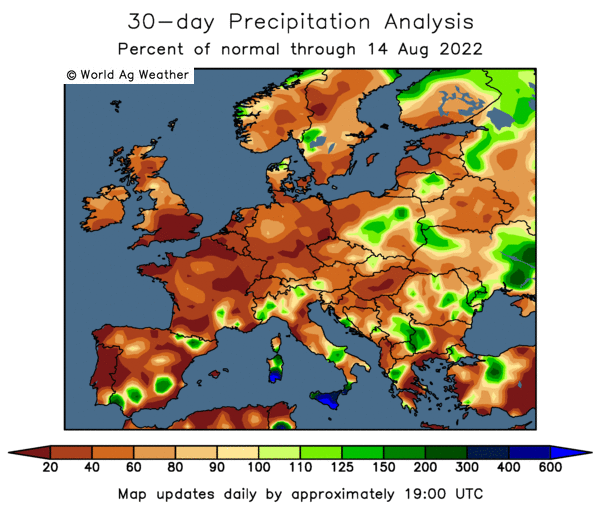 Above average precipitation also occurred in western France and Spain with lower expected impacts," they said. The EU Commission did however release their first forecasts for EU-28 grain production this year, pegged the all wheat crop slightly higher than last season at 145.5 MMT. They forecast the EU-28 barley crop at 56.9 MMT, which is 3 MMT lower than last year, with the corn crop seen at 69.7 MMT, a 3.7 MMT rise on output in 2012/13. EU wheat exports in 2014/15 were forecast at 22 MMT, a 4 MMT decline on this season's anticipated record 26 MMT. Brussels announced weekly soft wheat export licenses of 563 MMT, a fall on the 932 TMT issued last week, but that was the largest weekly total of the 2013/14 marketing year so far. Cumulative soft wheat export licences now stand at 20.8 MMT versus 13.7 MMT a year ago. Brussels also cleared 346 TMT worth of EU corn import licences, taking the 2013/14 marketing year to date total to 8.9 MMT. Tunisia bought 92 TMT of optional origin milling wheat for April/May shipment in their tender. French origin is the usual likely favourite. Jordan passed and immediately re-tendered for 100 TMT of optional origin barley for Jun/Jul shipment. Iraq bought 200 TMT of Canadian/Australian hard wheat. Origin Enterprises said that the UK wheat area for the 2014 harvest had jumped 23% versus last year to around 2 million hectares, aided by "near perfect conditions on farm" last autumn. 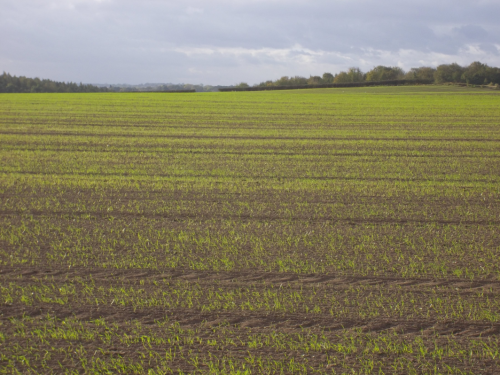 Rapeseed sowings were forecast 15% lower at 640,000 ha. 05/03/14 -- Soycomplex: Beans closed with generally modest losses, consolidating from the recent rally, as the USDA announced China had cancelled 245,000 MT of US soybeans for 2013/14 delivery. There was again a slightly more relaxed tone to the turmoil in Russia and Ukraine for a second day, adding a little bit of bearish sentiment. The harvest is moving forward in Brazil, in between the showers, and so are shipments. "The state of Goias in central Brazil has been one of the hardest hit states this growing season," says Dr Cordonnier. Dry conditions earlier in the growing season and no wet weather at harvest-time have taken the shine off yields. "The Agriculture Federation of Goias (Faeg) estimates that 1.8 MMT of soybeans were lost statewide due to the dry weather," he says. Yields in Goias are estimated at around 45 sacks per hectare versus 50-55 sacks/ha normally, he adds. For Monday's USDA Supply/demand report, traders see 2013/14 US soybean ending stocks falling to near 140 million bushels from 150 million last month. It will be interesting to see if the USDA will budge any lower than last month's 150 million, as they steadfastly refused to do so in 2012/13, regardless of the frenetic pace of US exports this season. Somehow, I doubt it. World soybean ending stocks are seen at 71.46 MMT, versus a February USDA estimate of 73.01 MMT. Trade estimates for the Argentine soybean crop are 53.5 MMT, with a further 88.14 MMT from Brazil. Last month's USDA estimates were 54 MMT and 90 MMT respectively. CONAB's Brazilian crop estimates come out on 12 March. Before that we get the regular weekly export sales report tomorrow. For that the trade is anticipating combined sales for both marketing years of 750 TMT to 1.2 MMT. Having been stuck in a terminal decline for the whole of 2013, soybean oil has suddenly found some traction, aided by palm oil hitting 17-month highs this week on persistent dryness in the major producing countries of Indonesia and Malaysia. 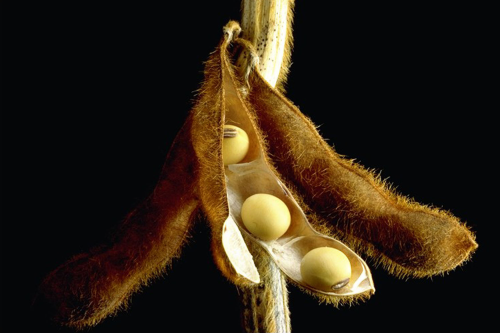 Mar 14 Soybeans closed at $14.20, up 2 cents; May 14 Soybeans closed at $14.20 1/2, down 2 1/2 cents; Mar 14 Soybean Meal closed at $457.70, down $1.10; Mar 14 Soybean Oil closed at 43.18, down 28 points. Corn: The corn market ended around 1 to 2 cents lower across the board. Again, a slight easing in tensions between Ukraine/the West and Russia may have encouraged a little bit of profit-taking following the recent rally to a near 6-month high. There is still no evidence of any notable disruption to grain shipments out of the region. Continued wet weather in Brazil is seen slowing progress with planting of second crop corn, underpinning the market. Weekly US ethanol production came in at 894,000 barrels per day versus 905,000 bpd last week and the near 930,000 bpd needed to hit USDA targets for the season. There's talk that China could approve MIR 162 GMO corn at some point during the first half of this year. That approval can't come soon enough as far as US exporters are concerned. There's a suggestion that uncertainty over corn supplies out of Ukraine may twist their arm a little to push the legislation through a bit quicker than they have so far seemed inclined to do. Monday's upcoming USDA report is expected to show US 2013/14 corn ending stocks increasing by 5-10 million bushels from 1.481 billion last month. World ending stocks are however seen falling by around 1 MMT to 156.27 MMT. The Brazilian corn crop is seen down around 1 MMT to 69 MMT, with Argentina's output maybe dropping by 0.5 MMT to 53.5 MMT. Favourable Argentine weather is in the forecast for the next few days. Drier weather is in the forecast for Brazil for next few days, which should speed up the soybean harvest and aid safrinha corn plantings a little. "As of the end of February, 75% of the safrinha corn crop in Mato Grosso had been planted, which is 13% behind last year's planting progress. The ideal planting window for safrinha corn in the state generally closes by the end of February, so approximately 820,000 hectares of corn will be planted later than desired," said Dr Cordonnier. Trade estimates for tomorrow's weekly export sales report are around 700 TMT to 1 MMT. Mar 14 Corn closed at $4.75 1/4, down 1 1/2 cents May 14 Corn closed at $4.82, down 2 1/4 cents. Wheat: The wheat market closed mostly a cent lower to 3 cents higher, although the thinly traded front month Mar 14 Minneapolis wheat continues to behave erratically. Has the sudden rush of fund money into Chicago wheat more or less run it's course? Benson Quinn Commodities point out that "another interesting development over the past week or so is the rapidly declining open interest in Chicago, which is now at its lowest level since 2010." That would suggest that recent developments in Ukraine have merely prompted funds to cover in their remaining Chicago wheat shorts, rather than indicate a flood of "new money" coming into the market. Whilst US winter wheat conditions at the end of February showed monthly declines for KS, OK and NE in the good/excellent category, it is worth noting that the figures for all three were still significantly better than a year ago (KS 35% G/E vs 23%; OK 31% vs 9% and NE 43% vs 12%). Despite recent price rises, there's still a fair bit of activity on the international tender market. Algeria bought 300-350 TMT of optional origin wheat (possibly French) for May-June shipment. They are also looking for 50 TMT of durum wheat for May shipment. In addition, Tunisia seeks 92 TMT of milling wheat of optional origin for April-May shipment, and Lebanon wants 25 TMT of the same for April shipment. Note though, that Informa yesterday raised their forecast for Indian wheat production this year to a whopping (and easily record) 108 MMT. India’s MMTC have released a tender to sell 80 TMT of wheat for March-April shipment, whilst another state-owned firm, PEC, have tendered to sell 70 TMT of wheat also for March–April shipment. Russia was said to have exported 812 TMT of wheat in February, up from 684 TMT in January, and exports may rise again in March. Monday's USDA report is expected to show US 2013/14 wheat stocks rising from the 558 million bushels forecast last month to around 570 million. World wheat ending stocks are seen little changed at 183.65 MMT. Trade estimates for tomorrow's weekly export sales report are 350-650 TMT. Mar 14 CBOT Wheat closed at $6.37 1/4, down 2 1/2 cents; Mar 14 KCBT Wheat closed at $7.03 1/4, down 1 cent; Mar 14 MGEX Wheat closed at $7.01 1/2, up 11 1/2 cents. EU Grains Mostly Firmer Again As Fund Money Piles Back In, But Will It Last? 05/03/14 -- EU grains finished mostly steadier, but off the day's highs, with Mar 14 London wheat ending GBP0.70/tonne firmer at GBP162.20/tonne, and with new crop Nov 14 London wheat closing GBP1.30/tonne higher at GBP153.30/tonne. Mar 14 Paris wheat was up EUR0.50/tonne to EUR207.75/tonne, Mar 14 Paris corn was down EUR0.75/tonne to EUR170.00/tonne, whilst May 14 Paris rapeseed rose EUR4.75/tonne to close at EUR406.75/tonne. All eyes remain focused on Ukraine and Russia, and the situation there is changing by the minute. As of mid-afternoon today, things look less tense than they did on Monday, but that could all change in the blinking of an eye. One thing that has already changed seem to be the recent, and sudden, flow of fund money coming out of equities and back into agriculture. They've been selling stocks and shares and instead featured as heavy buyers of corn, soybeans and wheat this past few days as a bit of "risk on" mentality returns to the market. Who wants to be long of Vodafone shares when there's a war on? Give me food commodities. That seems to be the new vibe. How long it will last remains to be seen. Several media articles are already likening the latest situation in Ukraine to the Chernobyl nuclear disaster of 1986, when grain prices initially shot up for the first couple of weeks, only to subsequently retreat back to where they'd started from across the following 3 weeks. More recently than that we had Fukushima in 2011, when London wheat fell GBP38/tonne in a week before subsequently recovering almost all those losses back again within a few days. 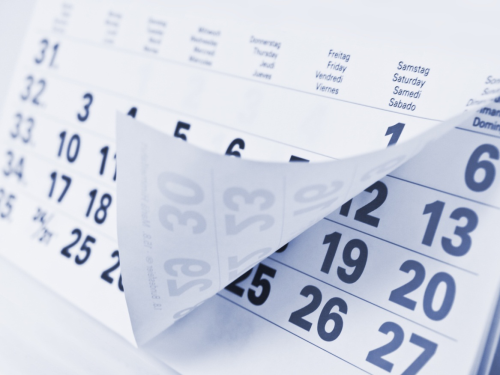 Both those two periods of extreme volatility were borne out of a knee-jerk reaction to a relatively unprecedented event that took the market by complete surprise. On both occasions the market couldn't really decide whether the incidents unfolding before their eyes were actually bullish, or bearish. That certainly has parallels with current events unfolding in Ukraine. Ukraine’s ports and shipping operations are said to be continuing virtually as normal, with the exception of the Crimean port of Sevastopol, which requires “special permission” to enter and exit. It currently looks highly probable that Ukraine will comfortably be able to ship the 10 MMT of wheat and 18 MMT of corn that the USDA expects in 2013/14. 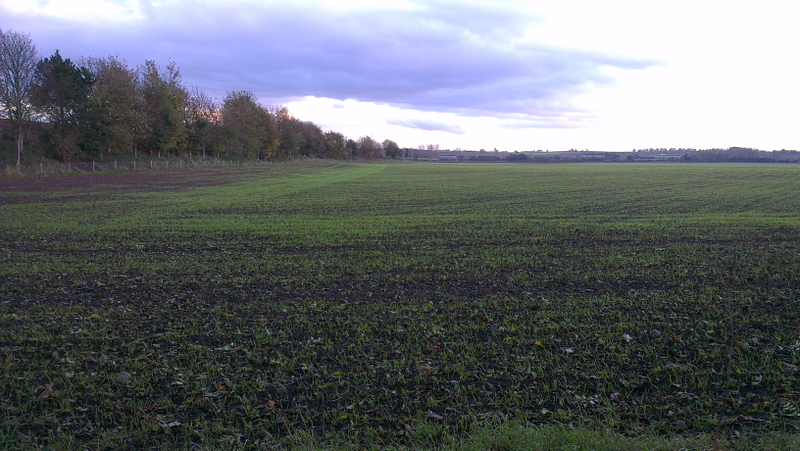 After all, 7.5 MMT of wheat and almost 15 MMT of corn has gone already. Meanwhile, crop conditions in the region remain good, warmer (GFS model) to much warmer than normal (CMC model) temperatures are in the forecast for the next fortnight, which gently coax winter crops out of dormancy and will also assist spring plantings too. Rusagrotrans said that preliminary export figures show that Russia shipped 1.3 MMT of grains last month, up from 1.15 MMT in January. That total included 812 TMT of wheat, up 18.7% versus January. They estimated March grain exports rising to 1.4-1.5 MMT, up from a previous forecast of 1.3 MMT due to better weather and increased international demand due to the achingly weak rouble. Russia still has plenty of wheat left to export, as was evidenced by the offers put up in last week's Egyptian tender, and especially so since the government recently gave up on their intervention purchase program with little more than 600 TMT in the bin versus the original target of 5-6 MMT. Almost completely lost in yesterday's bull run (it certainly passed me by until today) was news that Informa Economics had increased their forecast for the 2014/15 Indian wheat crop to an astonishing 108 MMT. That's an increase of 15.5 MMT in last year, and the equivalent to almost double the entire production of America. That's a lot of wheat, especially as the USDA has them carrying over 20 MMT of old crop stocks into the new season. They'll begin harvesting the 2014 crop in just a few weeks. Where we go from here most likely depends on fund money's next move. Note that US hog futures closed limit up last night, and went limit up again this afternoon, as swine flu sweeps across America. The reasoning is that this will lead to a sharp reduction in pig numbers in the US, and therefore prices have raced to all-time highs. Just remind me again, what do pigs eat? 04/03/14 -- Soycomplex: Beans finished a choppy session with gains of 10-15 cents. Early trade showed evidence of this being an infamous "Turnaround Tuesday" as prices retreated following a slight calming of tensions between Ukraine and the West and Russia. Nevertheless, renewed spec buying (funds added an estimated further net 5,000 soybean contracts to their already impressive existing long) pushed the market higher into the close. Dr Cordonnier cut his Brazilian bean crop estimate to 87.0 MMT from a previous estimate of 88.5 MMT. He said that harvesting in Mato Grosso is 60% complete, and that they are around 42% done nationally. He left his Argentina bean crop estimated unchanged at 53.5 MMT. Informa cut their Brazilian soybean production estimate to 88.8 MMT versus the USDA's 90 MMT, and also dropped Argentina from 57 MMT to 54 MMT. AgRural said that, as of Friday, 39% of the Brazilian bean crop has been harvested versus 36% a year ago and 31% on average. They estimated the Brazilian bean crop at 87 MMT. Oil World forecast global bean production at 278.8 MMT versus a previous estimate of 287.8 MMT and compared to 2012/13 production of 267.4 MMT. They have Brazil at 84 MMT and Argentina at 53 MMT. Global bean ending stocks were estimated at 72.5 MMT versus a previous estimate of 79.2 MMT and compared to 2012/13 ending stocks of 63.1 MMT. They see US 2013/14 soybean ending stocks at 3.5 MMT versus a previous estimate of 4.1 MMT and compared to 2012/13 ending stocks of 3.8 MMT. In their first peek into the season ahead, ABARES estimated the Australian 2014/15 canola crop at 2.948 MMT versus 3.548 MMT a year ago. Strategie Grains forecast the EU-28 rapeseed crop in 2014/15 at 21.5 MMT versus a previous estimate of 21.4 MMT and 21.1 MMT last year. Mar 14 Soybeans closed at $14.18, up 10 3/4 cents; May 14 Soybeans closed at $14.23, up 13 3/4 cents; Mar 14 Soybean Meal closed at $458.80, down $2.50;Mar 14 Soybean Oil closed at 43.46, up 135 points. Corn: The corn market shot higher, with the Mar 14 contract hitting the best levels for a front month since 12 September 2013. As with soybeans we saw two-sided trade today, but a surge of buying late in the session saw prices close near the day's highs. Despite an apparent slight softening in Russia's stance on Ukraine, fund money looks like it thinks it sees an opportunity and is now pouring into grains. They were estimated as net buyers if around 18,000 corn contracts on the day, to add to the 20,000 that they were thought to have stepped in for yesterday. Dr Cordonnier estimated the Brazilian corn crop at 68.5 MMT, unchanged from his previous estimate. He increased his Argentine corn production forecast to 23.0 MMT versus a previous estimate of 22.5 MMT. Informa cut their Brazilian corn production forecast by 1.1 MMT to 65.45 MMT, which is well below the USDA's 70 MMT estimate. Rains continue to delay the Brazilian soybean harvest, and therefore the planting of second crop corn. Informa left their forecast for the Argentine corn crop unchanged at 22.6 MMT versus the USDA's 24.0 MMT. Both Bunge and ADM said that their Ukraine operations are running as normal. The Ukraine Ministry said that the country had exported 2.82 MMT of grains in February, up 1.3% compared with January. That total included 2.33 MMT of corn. They also said that Ukraine had exported a further 340 TMT of grains in the first three days of March. Ukraine's corn exports for the period Jul-Feb now stand at a little under 15 MMT, making the USDA's forecast for the entire season of 18 MMT seemingly well within reach if things carry on as they are. Reports that Russia had blocked the Kerch Strait, which provides access to the Black Sea for ships carrying grain, were denied by the Ukraine infrastructure ministry - at least with respect to the movement of non-military vessels. Mar 14 Corn closed at $4.76 3/4, up 12 3/4 cents; May 14 Corn closed at $4.84 1/4, up 13 3/4 cents. Wheat: The wheat market closed higher, with the exception of the technical nearby Minneapolis contract. As with the other grains, wheat was in the red in early "Turnaround Tuesday" style, but clawed its way higher as the open outcry session wore on. Fund buying in Chicago wheat (the only one of the three wheat pits where they are still short) was a feature again. Afternoon reports that Russia had test-fired a intercontinental ballistic missile may have been responsible for further late buying in wheat. Ukraine's wheat shipments so far this season (Jul-Feb) are at 7.43 MMT versus a USDA forecast for full season shipments of 10 MMT, leaving around 2.5 MMT left to go to hit that target. Despite the ongoing problems with Russia, grain exports are said to be continuing relatively unhindered. That doesn't seem to matter though, if the funds suddenly fancy wheat again. The latest monthly crop condition reports show month-on-month declines in US wheat rated good/excellent for Kansas (down 1% to 34%), Nebraska (down 3% to 43%), Oklahoma (down 5% to 31%) and Texas (down 4% to 15%). Japan seeks 111,779 MT of wheat for April–June shipment, in it's routine combination of US, Canadian and Australian origins. Algeria is tendering for 50,000 MT of optional origin milling wheat for May shipment. Australia's ABARES forecast the 2014/15 wheat crop there at 24.8 MMT, down 8% versus output of 27.0 MMT last year. Despite lower production though, they see Australia's 2014/15 wheat exports rising to 19.1 MMT versus 18.5 MMT this season. They forecast wheat plantings rising 130k ha to 13.6 million ha, but currently anticipate lower yields. It's currently very dry Down Under, although this is Australia in the middle of their summer that we are talking about, not the Somerset levels in the midst of a British winter. Wheat planting doesn't begin until May, so there's time for some improvement yet. Mar 14 CBOT Wheat closed at $6.39 3/4, up 13 cents; Mar 14 KCBT Wheat closed at $7.04 1/4, up 3 cents; Mar 14 MGEX Wheat closed at $6.90, down 5 3/4 cents. 04/03/14 -- EU grains finished a choppy session mostly a little higher, despite trading lower for much of the day as tensions between Russia and Ukraine eased somewhat. Trade houses such as ADM and Bunge say that operations within Ukraine are "normal" and that exports continue relatively unhindered. Mar 14 London wheat ended GBP0.50/tonne higher at GBP161.50/tonne, and with new crop Nov 14 GBP0.15/tonne firmer at GBP152.20/tonne. Mar 14 Paris milling wheat was EUR1.25/tonne lower at EUR207.25/tonne, Mar 14 Paris corn was EUR2.00/tonne weaker at EUR170.25/tonne and May 14 Paris rapeseed added EUR2.00/tonne to post a new near 8-month closing high of EUR402.00/tonne. The local Ag Ministry said that Ukraine's grain exports for the season so far are at 24.7 MMT, up 36.8% on a year ago. That includes 7.43 MMT of wheat, 2.14 MMT of barley and 14.89 MMT of corn. The USDA currently have Ukraine's full season exports at 10 MMT for wheat and 18 MMT for corn, meaning that around 2.5 MMT of wheat and 5 MMT of corn remains unshipped so far. They Ministry added that Ukraine shipped 2.82 MMT of grains in February, most of which (2.33 MMT) was corn. They said that the country has exported a further 340 TMT of grains in the first three days of March. Strategie Grains said that the EU-28 OSR crop will amount to 21.5 MMT this year, up from the 21.4 MMT forecast previously and 1.9% up on the 21.1 MMT produced in 2013/14. Despite wetness issues in the UK and France, yield potential hasn't yet been diminished, they added. Algeria seeks 50,000 MT of optional origin milling wheat for May shipment. Jordan is in for 100,000 MT of optional origin feed barley for May/Jul delivery. The Turkish Grain Union said that wheat yields there will decline 14% this year due to drought. ABARES forecast the Australian 2014/15 wheat crop at 24.8 MMT, down 8% versus 27 MMT last year. Despite that though, exports will rise from 18.5 MMT to 19.1 MMT, they added. They see the wheat planted area up 130k ha to 13.6 million ha, but currently forecast yields lower. The Australian canola crop was estimated at 2.948 MMT versus 3.548 MMT a year ago. Winter wheat crop conditions in the US remain in decline. The latest monthly reports show Kansas good/excellent down 1% versus a month ago to 34% (although that's still better than only 23% a year ago), with Nebraska down 3% to 43%, Oklahoma down 5% to 31% and Texas falling 4% to 15%. The current situation remains extremely volatile, and could flip to bearish at any moment, depending upon the latest developments in the Black Sea region. It seems unlikely that the West will want to risk military intervention in the area. It also seems unlikely that Big Bad Vlad will want to back down, however. Will the West simply allow Russia to annexe the Crimea, or even a larger part of eastern Ukraine? If not, what sanctions/repercussions will the West propose? Bearing in mind that Russia is a very major gas supplier to Europe. 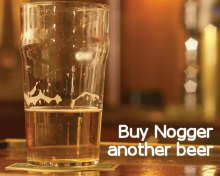 Do we need them more than they need us, or is it the other way around? 03/03/14 -- Soycomplex: Beans closed mixed, after trading sharply higher in earlier overnight trade. That seems to have been linked to the unwinding of long beans/short corn/wheat spreads once the open outcry session began. Everything was firmer across the board to start the day, as tensions in Ukraine were ratcheted up a few more notches over the weekend. Stocks across the world fell, but grains, gold and crude rose as Russia seized control of Crimea and issued an ultimatum to Ukraine forces in the region to surrender of face assault. Although Ukraine is a soybean and rapeseed grower, it is of course far more active in the corn and wheat market, which may also help explain today's price action. Weather concerns in South America remain, with IMEA cutting it's forecast for the soybean crop in Brazil's leading Mato Grosso state from 26.88 MMT to 26.39 MMT, with yields seen falling 1.8% to 53 sacks/ha. Some farmers are harvesting beans at 20% moisture in between the showers, meaning that they also face significant drying costs, something for which there is a lack of capacity in the region. This apparently means that there are long lines of trucks of beans queueing at elevators in the region capable to drying beans, further stretching out the harvest and causing more logistical problems. Weekly export inspections for beans were 984,181 MT versus 1,312,679 MT last week and expectations of 1.0-1.2 MMT. There's talk that a major port in northern China has been forced to stop unloading soybeans after running out of capacity at its storage facilities. Fund money was estimated as finishing as a net seller of around 4-5,000 soybean contracts on the day. Mar 14 Soybeans closed at $14.07 1/4, down 7 cents; May 14 Soybeans closed at $14.09 1/4, down 4 3/4 cents; Mar 14 Soybean Meal closed at $461.30, down $6.60; Mar 14 Soybean Oil closed at 42.11, up 59 points. Corn: The corn market jumped around 6-7 cents, although that close was well off the intra-day highs on short-covering and spec buying following weekend events in Ukraine - set to be the third largest corn exporter in the world after the US and Brazil this year. The USDA announced 140,000 MT of corn sold to South Korea for 2013/14 delivery. They also said that 211,500 MT of US corn had been sold to Japan, comprising 47,000 MT for 2013/14 shipment and 164,500 MT for 2014/15 shipment. Agritel said that Ukraine had shipped 500 TMT of corn last week. That may change this week, we will have to wait and see. They estimated that Ukraine still has a further 5 MMT of corn left to ship in 2013/14. Regardless of what is going on in the region, spring plantings are said to be underway in both Russia and Ukraine. Talk of Western sanctions against Russian aggression may take the form of an embargo on imports of Russian corn and wheat possibly? 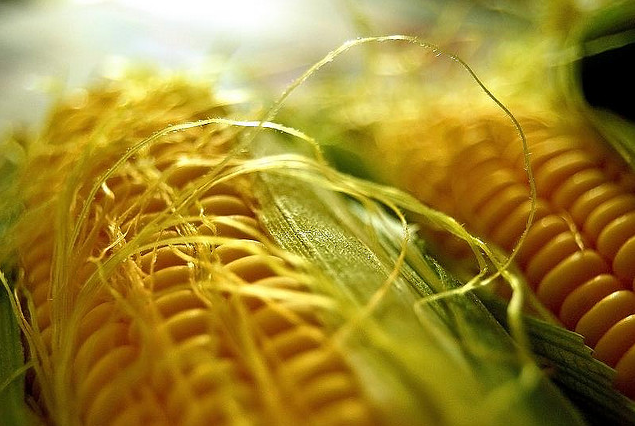 China are reported to have rejected 887,000 MT of US corn since November due to the unapproved GMO strain MIR 162. Fund buying was estimated by some to be as high as a net 20,000 contracts on the day today. Brazilian rains that are slowing the soybean harvest will also be having a negative impact on safrinha corn plantings. Weekly export inspections of just over 1 MMT were above trade expectations and above what is required to hit the USDA's target for the season. Corn planting for the new 2014 season is underway in Texas, with 8% of the crop now in the ground versus 3% last week and 14% this time a year ago. Rumours persist from Friday that the EPA may soon revise upwards the ethanol mandate to come in near 13.5 billion gallons. Mar 14 Corn closed at $4.64, up 6 1/2 cents; May 14 Corn closed at $4.70 1/2, up 7 cents. Wheat: The wheat market shot higher on the news that the Ukraine crisis had stepped up a gear over the weekend. Wheat in Chicago is the only agri-commodity left that fund money is short of, even if they have reduced that short quite dramatically since the turn of the year. That may help explain why wheat led the rest of the market higher today. Ukraine is just about sold up on wheat for 2013/14 it would seem, although they may have up to 3 MMT of wheat sold and as yet unshipped, according to Agritel. Russia however remain an active seller, as was witnessed in last week's Egyptian tender. Some form of Western sanctions against Russia may include an embargo on wheat imports. That could mean more business for the US and Europe, although I'm sure that China would probably be first in the queue to "help" Russia by increasing its purchases of wheat and corn from them. That's wheat and corn that they would otherwise have bought from the West, so an embargo could be something of a two-edge sword. There's some talk that Canadian growers are struggling to get their bumper 2013 wheat crop onto the cash market. This means that some are struggling for the funds needed to purchase inputs for 2014 spring plantings, it is being mooted. Logistical problems, added to by extremely cold weather are forcing the Canadian railways to operate shorter trains running at slower speeds, continue to restrict the movement of grains. This could ultimately have a negative impact on spring plantings some suggest. Weekly export inspections for US wheat were 609,867 MT versus 482,430 MT a week ago. Mar 14 CBOT Wheat closed at $6.26 3/4, up 27 3/4 cents; Mar 14 KCBT Wheat closed at $7.01 1/4, up 24 1/4 cents; Mar 14 MGEX Wheat closed at $6.95 3/4, up 25 cents. 03/03/14 -- EU grains closed sharply higher as tensions between Ukraine (and the West) and Russia scaled up a level or two over the weekend. This is the biggest crisis of the 21st Century for Europe, according to British Foreign Secretary William Hague. Russia's military has given Ukrainian forces in Crimea until dawn on Tuesday to surrender or face an assault, the BBC reports. Mar 14 London wheat closed GBP5.25/tonne firmer at GBP161.00/tonne, whilst new crop Nov 14 was GBP4.55/tonne higher at GBP152.05/tonne. Mar 14 Paris wheat closed EUR7.25/tonne higher at EUR208.50/tonne, Mar 14 Paris corn was up EUR3.50/tonne at EUR172.75/tonne, whilst May 14 Paris rapeseed was EUR5.25/tonne higher at EUR400.00/tonne. Crude oil jumped to it's highest since September, and short-covering/spec buying meant that wheat followed suit, despite reports that grain exports out of Ukraine had so far largely continued relatively unhindered by recent developments. Agritel said that Ukraine exported over 500 TMT of corn last week, along with 57 TMT of wheat, and that Russian ports on the Black Sea had loaded more than 200 TMT of wheat in the final week of February. Nevertheless, the threat of a sudden halt to Ukraine's exports (of corn in particular) has got the market very nervous. They are scheduled to be the world's 3rd largest exporter of corn in 2013/14, along with being the 6th largest exporter of wheat. Agritel suggest that Ukraine still has around 5 MMT of corn and 3 MMT of wheat left to export this season. The Ukraine hryvnia and Russian rouble fell to new lows against the US dollar and euro, which in theory makes exports out of the region even cheaper. It also makes imports very expensive though, and raises the question of whether growers in the region will be able to afford to pay for these products later in the year. What will Europe and the West do, if anything, in retaliation to the Russian invasion of Ukraine? This isn't sending a few thousand troops into Afghanistan to fight the Taliban, after all. Will (most of) the world announce sanctions against the import of Russian grains? If they do, will China follow suit? As ever, the market doesn't like uncertainty, and so up it goes. As stock markets around the world fall, it now seems like agri-commodities are suddenly back in vogue. That's changed in the blinking of an eye, and could just as easily switch back again of course. Is this a selling opportunity, or the start of a move back to old ground, many are asking? 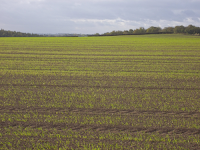 In other news, the HGCA reported that England and Wales had planted more than 3.8 million hectares of winter wheat, barley, oats and OSR by Dec 1, a 14% increase on last year. They said that 1.815 million ha of that was wheat, 19% more than the entire harvested area in 2013, before including ant late winter wheat and/pr spring planted crops. The winter barley area was almost 370k ha, the highest since 2003, and the winter OSR area was just over 700k ha, up 3% from a total (winter and spring) area last year, they added. “The higher wheat area increases the likelihood of the UK being able to return to being a net exporter of wheat in 2014/15. However, weather conditions during the rest of the growing season will be important in determining the quality and yields, and thus the UK’s export potential next marketing season,” they concluded. Friday's Paris corn close was the first sub-zero EUR170 finish in 17 weeks. Conversely, it was Chicago corn's highest close in 26 weeks. The euro was last this high against the US dollar 19 weeks ago. That might have had something to do with it, although it's interesting to see Paris corn close on it's arse when it's all kicking off in Ukraine. This was the highest soybean oil close in 18 weeks, and the best for beans and meal in 25 weeks. It was also the first close above EUR200 for Paris wheat in 9 weeks, and the highest close for Paris rapeseed in 25 weeks.